Southern Utah Attractions: Community Give Back! I am really excited to announce a new project I have planned for this blog. We are so lucky to live in or be able to visit this fantastic part of Utah. Southern Utah is full of wonderful people, amazing beauty, and great businesses and organizations. I want to start a tradition here on Southern Utah Attractions to give back to the community at least twice a year. Summer and the holiday season will be the times of the year that we focus on the community and give back to those in need and help make the Southern Utah community a better place. I can't do it without YOU! I need your vote!! I have picked three organizaitons in St. George that have amazing purposes and ambitions. It was really hard to narrow it down to three because there are so many great organizations that I wish we could help. Now I need your help to narrow it down to one organization that we as a whole can focus on helping this holiday season. The goal I want us to achieve this season is to collect items from the wish list of the organization we choose and I will deliver the items to the organization. I will make a video of the process and post it to YouTube so you can all see the generosity of you and the other Southern Utah Attraction's readers. I will do another post with instructions on how to participate in this project once I collect all the votes. Below is a brief summary of what each organization is all about so you can know who you want to vote for. Dove Center: The Dove Center provides a safe, confidential place for women and children to escape to who are victims of domestic violence and/or sexual assault. They will also help men who are victims by helping them find shelter outside of the center. They also provide advocacy and counseling for these victims. To read more visit their website. Children's Justice Center: The Children's Justice Center is a home-like, safe, and comfortable place for abused children to be interviewed and go through the investigation process. The goal of the CJC is to protect abused children from added trauma during the investigation process, advocate for them and help them to get medical examinations if necessary. To read more visit their website. Switchpoint: Switchpoint goes above and beyond just providing food and shelter for the homeless. Switchpoint helps the homeless to gain independence and become self-reliant. Each person living in the short term housing at Switchpoint is assigned a case manager who helps them become marketable and employed. They also help them get housing and gain the skills that they need to live on their own. To read more visit their website. 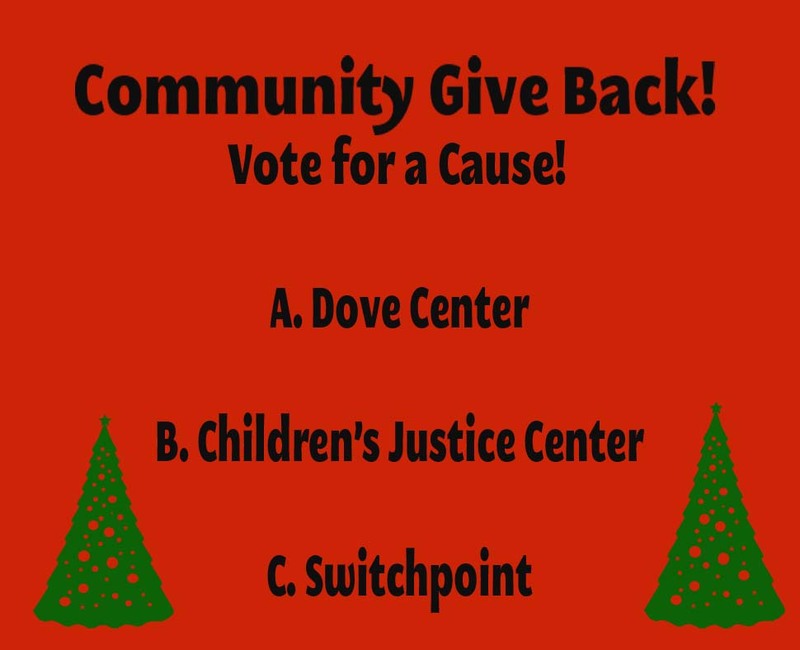 Be sure to vote for the organization you want to help this holiday season. You can vote in the comments below, on Southern Utah Attraction's social media accounts, or by e-mailing me at stgeorgeattractions@gmail.com. Remember, I can't do this without you! They are all so worthy I can't vote yet. I'll be back.